I've been meaning to post on the blog these photos from a lunch I had at Lake House several weeks ago. Unfortunately the lunch was right in the middle of that period when I was furiously writing my masters essay, so I was somewhat distracted (and consequently I'm afraid I can't provide you with the level of detail the food deserves). 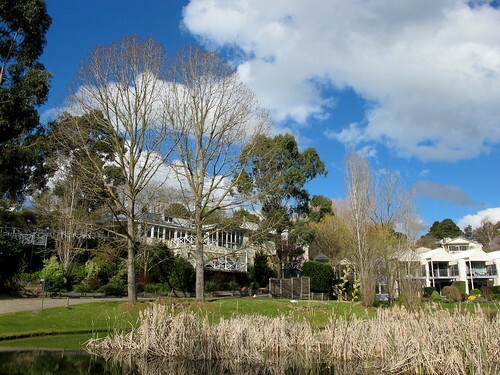 But I still really enjoyed our day trip up to Daylesford - it was the perfect temporary escape from my study cocoon - and I was mightily impressed by the food, wines and service at Lake House. 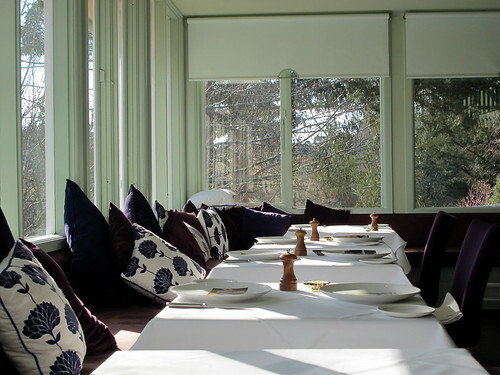 For my birthday, I'd been given a voucher from a gentleman friend for a three course lunch for two at Lake House. 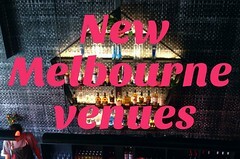 As an indicative guide for you, the lunch menu is $68 for two courses or $85 for three (or the degustation is $130 for an eight course menu ($115 for vegetarians) with an additional $70 if you want matching wines). 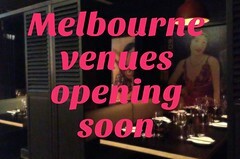 There is also an express lunch ($50 for two courses and a glass of wine) from a pared-down menu. I chose to take best-friend-K along with me, and after a strong coffee at Proud Mary one Saturday morning we hit the road and fanged it up to Daylesford. The restaurant was nearly full and we were led down to a lovely corner table near the window. 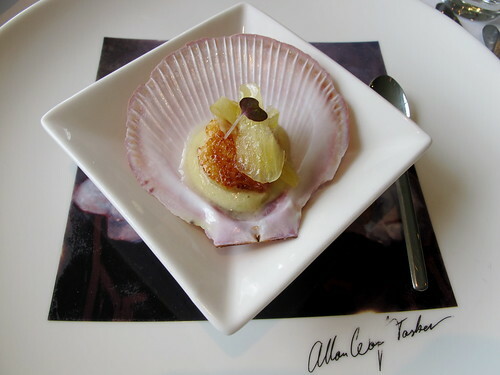 We were each given a scallop amuse-bouche to begin with. 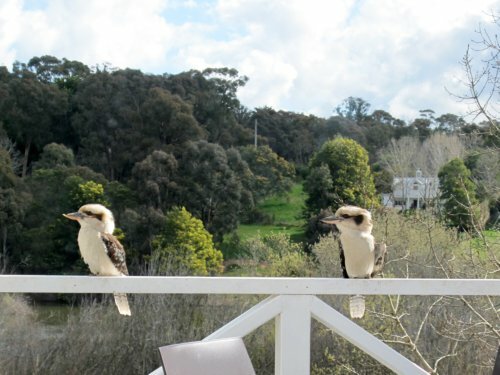 As we ate them, a pair of kookaburras stopped by on the balcony to pay us a visit (and to gobble up gourmet offcuts from the kitchen). 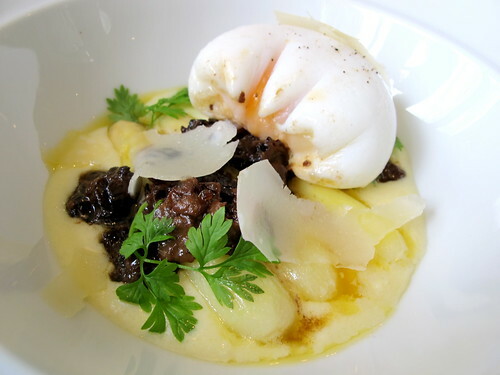 When I'd mentioned I was going up to Lake House, a Melbourne chef had recommended I try the entree of white asparagus with a ragout of locally foraged morels, soft polenta and a poached duck egg. HOO BOY am I glad I was given that recommendation, as this entree was sublime. Incredibly rich, of course, and exploding with flavour - those morels! The asparagus! That egg! A really memorable dish. 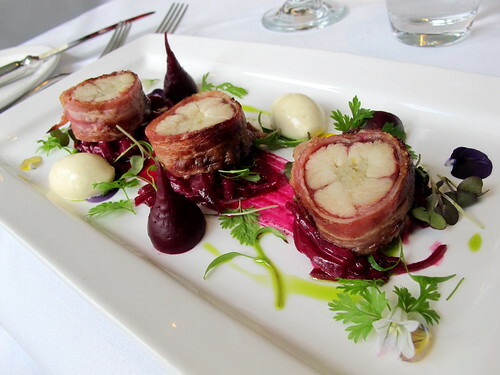 B-f-K's entree was spectacularly presented: smoked Skipton eel wrapped in pancetta, served with a shallot confit, beetroot remoulade, mustard crème fraiche, seasonal shoots and flowers. I'd asked restaurant manager Martin Fairhurst a couple of nerdy food questions about the chawanmushi and the tempura in the quail entree as we were placing our order, and so he naughtily brought us a serve of it to taste, compliments of the kitchen. 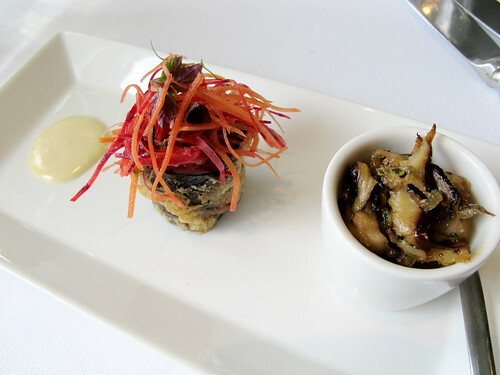 The chawanmushi was topped with shiitake mushrooms, and the tempura-ed tower of juicy quail was topped with a julienned salad and a serve of wasabi mayonnaise. The pretty view of the lake from the restaurant. 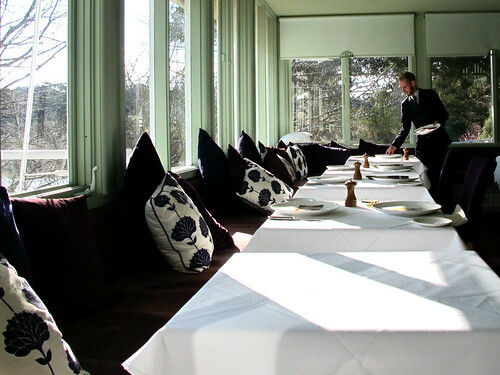 The geese on the lake can be summoned by the restaurant staff: Martin stood on the balcony and called "GOOSEGOOSEGOOSEGOOSEGOOSE!" 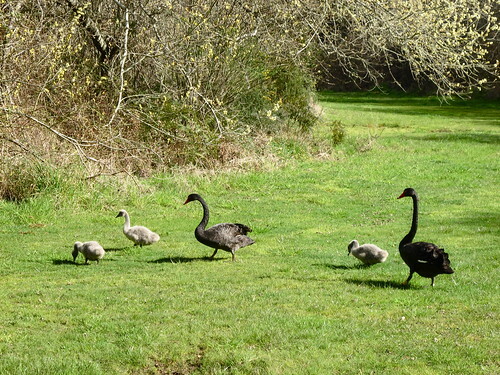 in a loud, high-pitched voice and geese immediately swam across the lake, clambered out of the water and started waddling up the hill towards us, looking like velociraptors. They were most obliging. 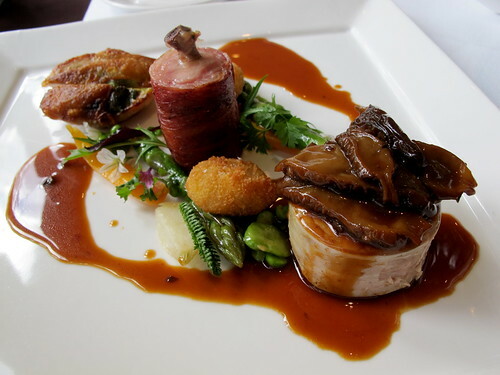 B-f-K's main course was described in the menu as "free roaming chicken - roast leg, breast, ballotine, spring vegetables, foie gras croquettes, morel sauce". Again, the morels gave the dish a wonderful richness, as did the crumbed foie gras. 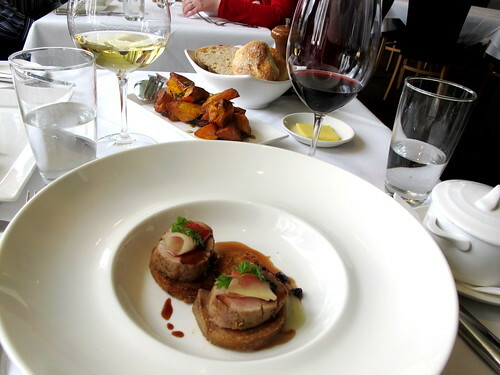 Mine was the pork dish: brined loin, crisped rolled belly, trotter croquette, finished with a light smoke. 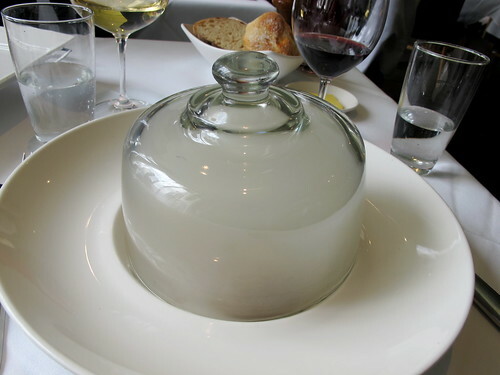 The bell jar filled with smoke that was whipped off the plate with a flourish after it was placed before me gave a pleasing sense of drama to the proceedings. The pork also came with a side dish, a spring braise of savoy cabbage and peas (in the tureen to the right). Martin also insisted on bringing us a side of spiced roast pumpkin that was the BEST PUMPKIN EVER. I'm racking my brains to remember what the secret ingredients were that made it taste so extraordinarily delicious - can anyone help me out? After all that food we were pretty damn full, so we adjourned for a walk around the lake, in the hope of working up sufficient appetite for the dessert that was yet to come. It was a spectacular spring day. Cygnets! Such a treat for city kids like us. 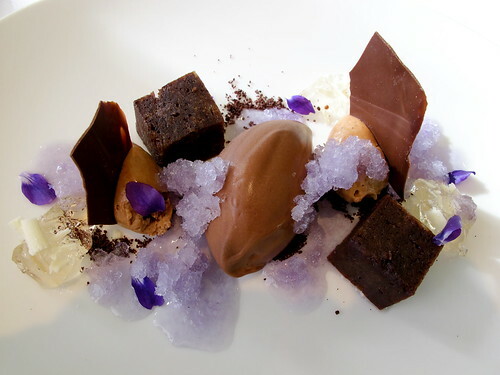 My dessert was described on the menu as "a multitude of chocolate textures - with spring violets" and what a good looking dish it was too, what with the different shades of chocolate (from the white chocolate jelly to the dark chocolate and hazelnut cake) and the violet granita. The best looking dessert I've had in ages, and the violet flavour cut through the different chocolates beautifully. 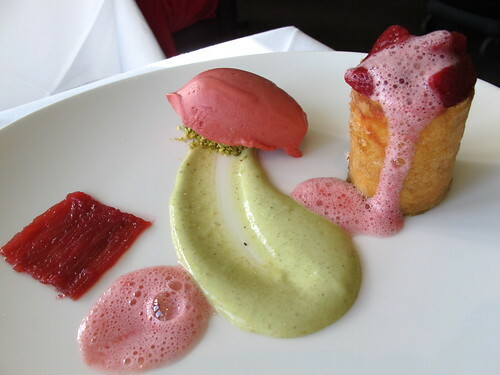 B-f-K's dish was described simply as "strawberries, rhubarb, pistachio", and she loved it. 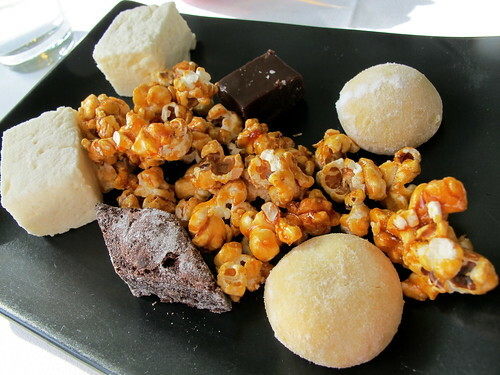 Afterwards we were brought a few sweets, all of which were hand-made at Lake House: spiced popcorn, melting marshmallows, brownies, salted caramel fudge and Austrian shortbread. Unfortunately by this stage we were SO full we could barely make a dent in this dish, but the salted caramel addict in me made a special effort with the fudge. Divine. B-f-K was also a big fan of the strongly spiced popcorn. Not only was the food at Lake House excellent, but the service was top-notch. Sommelier Tom Hogan was also lovely to us, helping me choose a suitable wine by the glass (as I was driving back and unable to order a bottle, *sob*) and chatting affably about Italian wines. I'd never been to Alla Wolf-Tasker's restaurant before, but I can't wait to get back there again now that I've been. oMGosh, no fair, you're making me want to drive up there now... =). although i am on holidays, so i actually could... now to find some company hehe. Holy Moley! The food looks gorgeous - those desserts have me drooling and what gorgeous geese to boot! Oooh nice pics and sounds like a great lunch. 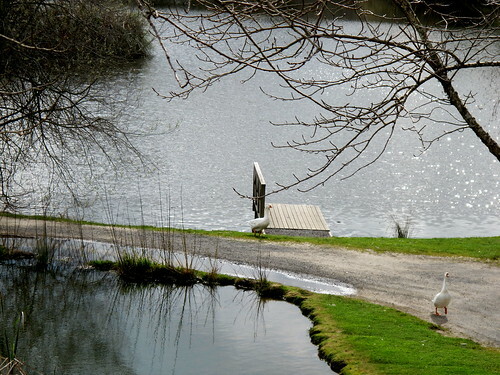 I haven't been to Lake House in years and it rained when we were there, so no geese-strolls. that pumpkin looks awesome! 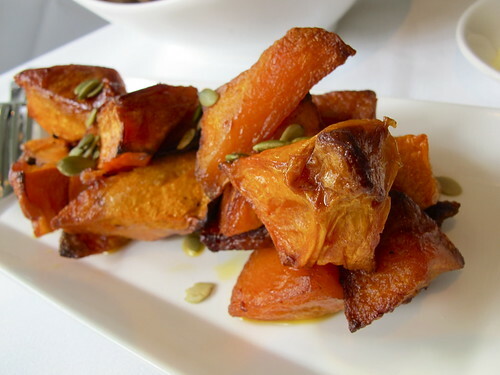 Good roast pumpkin is surely the best thing ever. If there was persian feta in amongst it, then that would be even better! 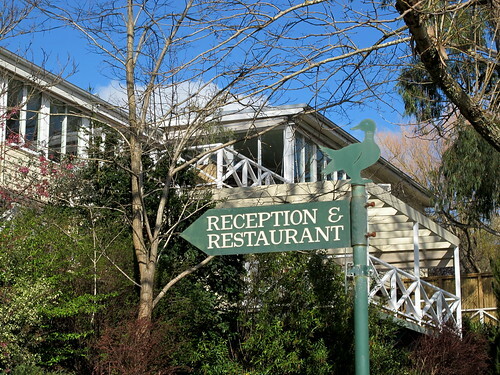 Lake House always has fantastic service and memorable food - highly recommended, no matter what time of the year it is. 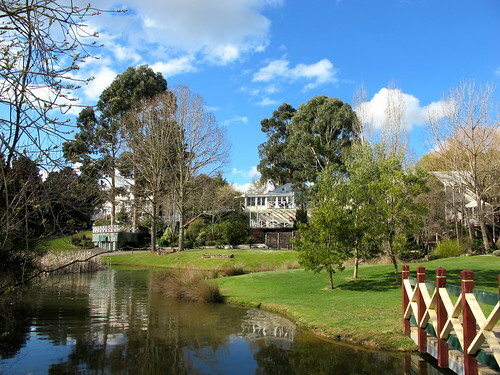 And for those who haven't been to Daylesford, it's an easy drive from Melbourne and you can do a loop (up on the Ballarat freeway, back on the Calder) through some very pretty countryside. 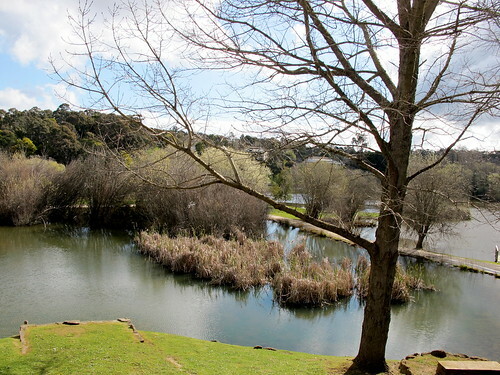 Thanks Claire - just returned from Daylesford and discovered your blog. We ate many of the same dishes and was great to see your fab photos. You visited on such a gorgeous day! I love the Lake House, we went once for a spa detox weekend (complete with spa detox menu) but caved in on the very first night after seeing plates of some very aromatic food being carried past us. And the ducks and geese are adorable! Cheers Steve. I agree, with your assessment! Thanks for your comments, everyone! And Lioness is right, it's still an easy day trip up from Melbourne (as long as one of you is willing to go easy on the vino).